On Sunday Night, ABC will be airing a special called “The ABC’s of Schoolhouse Rock” and seeing how my love for Schoolhouse Rock knows no ends, I will, of course, be tuning in. When I was just a wee little lassie, my mom got us a VHS set of these educational little ditties and I gobbled them up. At the age of five, I was singing the preamble to the Constitution, my multiplication tables, and conjunctions even if I didn’t really understand what I was singing. Schoolhouse Rock holds a very special, nostalgic place in my heart, but I still have my favorites. I should say that my favorites tend to be different than the most popular songs (“Conjunction Junction”, “I’m Just a Bill”) and I am not very familiar with the newer songs. 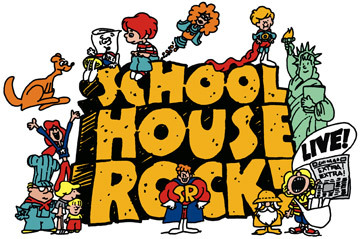 Do you have a favorite Schoolhouse Rock? Were these songs as ingrained in your childhood?